Home ‣ Public Health ‣ FMCH ‣ SIDS Program ‣ How Can You Reduce the Risk of SIDS? Too many infants die during sleep from unsafe sleep environments. There are ways for parents and caregivers to reduce the risk of sleep-related causes of infant death. 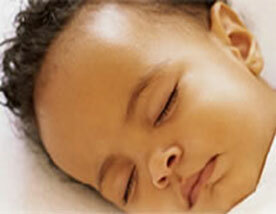 The American Academy of Pediatrics (AAP) expanded their recommendations for a safe infant sleeping environment in 2011. Place your baby on their back for every sleep. You may offer a pacifier once breastfeeding is established. Visit your baby's doctor for regular check-ups and immunizations. Be careful not to overdress your baby or let your baby get too hot. Give your baby plenty of supervised play time on their stomach when awake. Do not use home cardiorespiratory monitors, wedges, positioners, or special sleep surfaces that claim to reduce the risk of SIDS. Educate babysitters, day care providers, grandparents, and everyone who cares for your baby about safe sleep practices. Don't forget to enjoy your new baby! Adapted from California Childcare Health program & American Academy of Pediatrics, 2011, SIDS and Other Sleep-Related Infant Deaths: Expansion of Recommendations for a Safe Infant Sleeping Environment.